Daniel Lee and Sarah Laperriere during a recent sampling trip. Nitrous oxide (N2O) is a greenhouse gas with many times the global warming potential of carbon dioxide. Once it reaches the atmosphere, the only sink for N2O is reaction with ozone in the stratosphere. This means N2O is very long-lived in the atmosphere, and that understanding its sources, and how those sources vary in space in time, is important. N2O is produced by microbes, and low oxygen conditions seem to enhance N2O production. It is estimated that about one quarter of the N2O emitted to the atmosphere comes from marine sources. How much coastal environments-like the Chesapeake Bay-contribute to this amount is not well known. 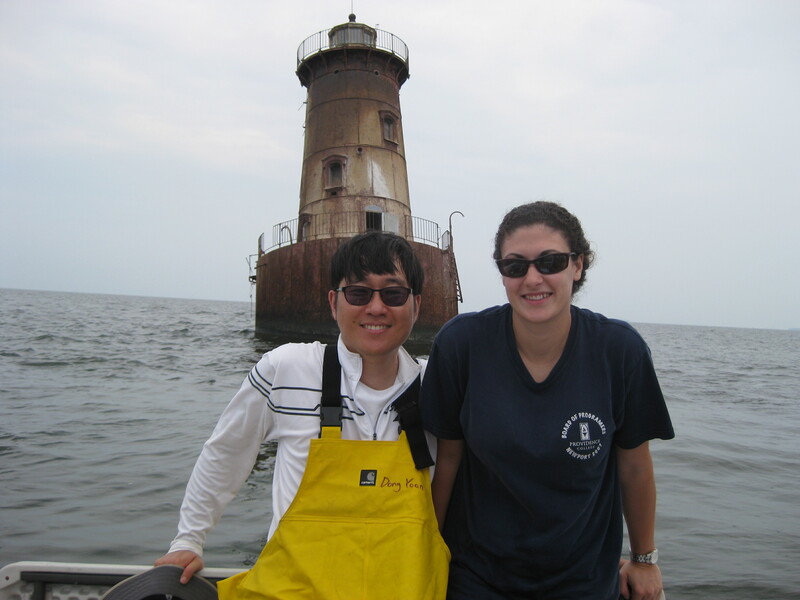 We have begun making dissolved N2O measurements in the water column of the Chesapeake Bay during the annual cycle of low-oxygen conditions to understand whether or not the Bay is a source of N2O to the atmosphere.